Two weeks ago, Iraqi forces reported the conquest of the largest oil refinery in Iraq. Now it seems as if it could fall back again the IS forces. 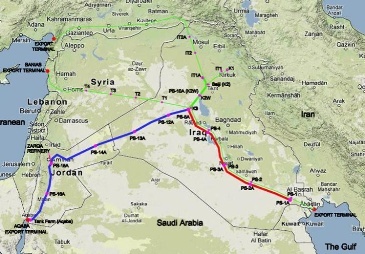 Iraq plans to build a new two leg pipeline from 1) Basra-Haditha (red, 680 km, 2.25 mbd) and 2) Haditha-Aqaba (blue, Jordan Red Sea port, 1000 km, 1 mbd).